Having visited Yo! Sushi in the UK and seen pictures of conveyor belt sushi restaurants in Japan, we were curious about how the two would compare, so when the lovely Rio at our hostel in Kobe recommended a branch of the Kura Sushi chain we decided to take a break from the beef and give it a go. On arrival we were given a small board with a diagram of the restaurant and arrows showing us how to get to the table. 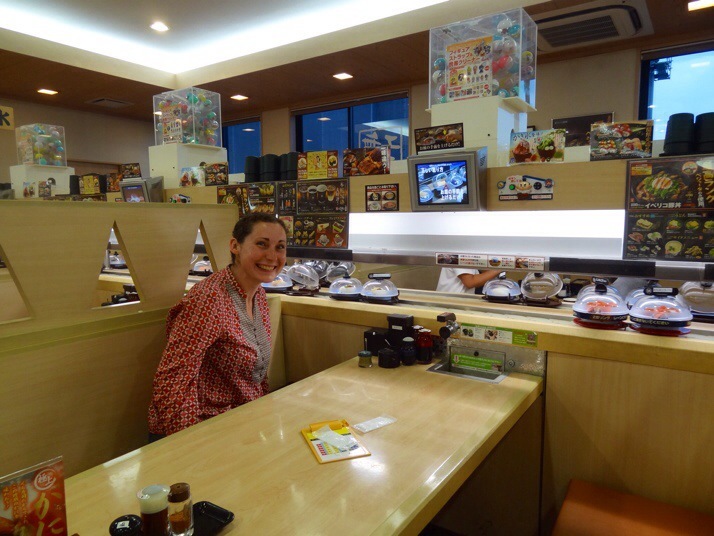 OK, they don’t even show you to your table, this is definitely going to involve less human contact than we are used to in restaurants… Our table was a small booth with the conveyor belt moving along beside it. 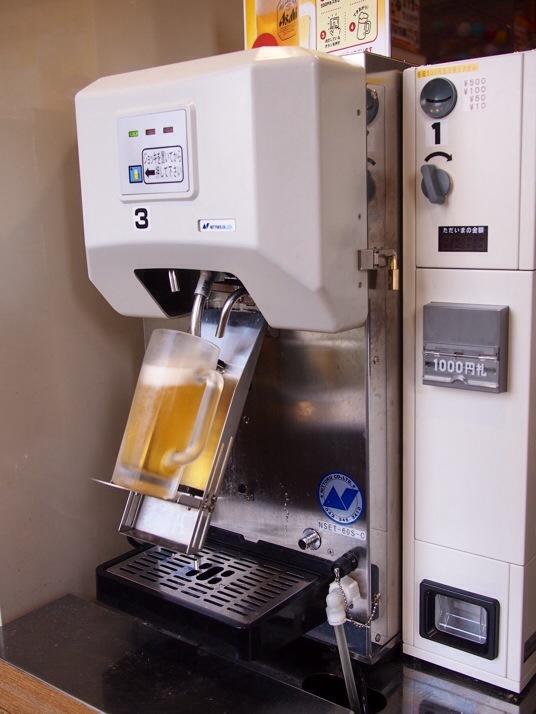 A draught beer vending machine!. 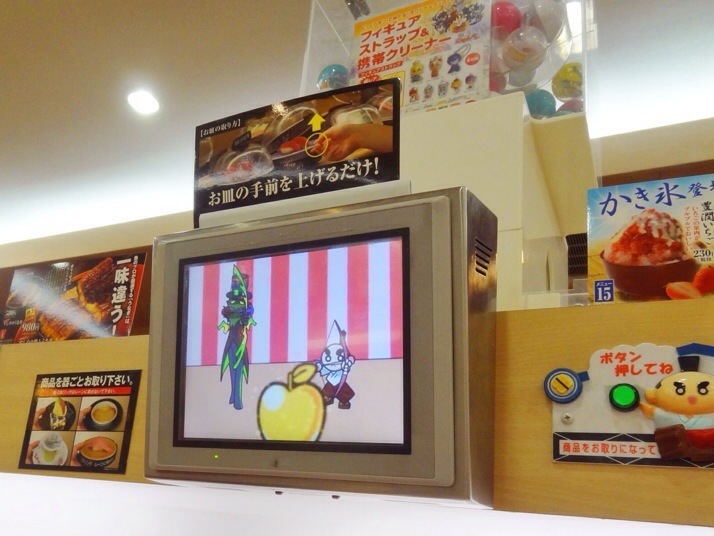 Insert a ¥500 coin, take a cold glass from the fridge, place it on the stand and press start. The machine tilts the glass, pours the beer with a perfect head and away you go! By this point we were accumulating quite a stack of plates, but we could see that the nearby tables were empty apart from plates with food on. What were they doing with their empties? We’d already noticed a kind of plate shaped post box at the side of the booth, maybe we put them in there? In Yo Sushi! the plates are different colours which signifies different prices but here they’re all the same ¥100 (about £0.60) or some dishes are double and come on two plates held together with a clamp so it made sense. 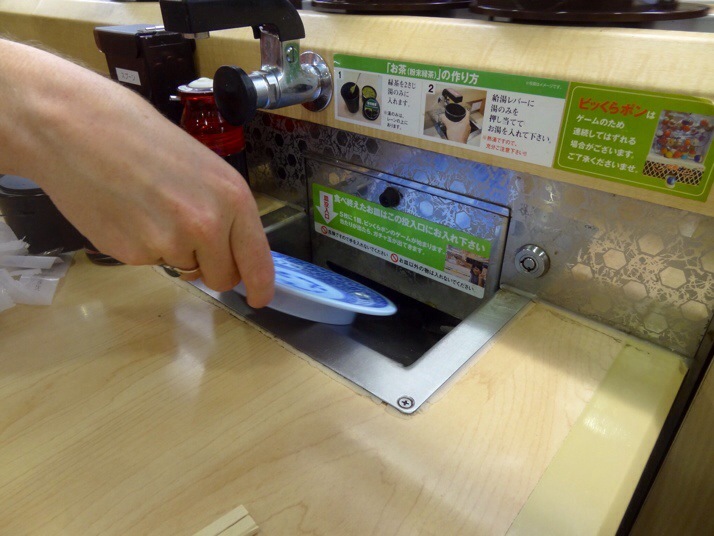 Disposing of dirty plates – I bet you wish you had a slot like this at home! As we fed the plates into the slot we noticed a counter in the corner of our display incrementing. When it got to 5, there was a loud trumpeting sound from the screen and it started to play a little cartoon of a contest. We had no idea what was going on but it must have been a success because the hitherto unnoticed vending machine above the screen clanked into action and delivered us a prize in a plastic ball! It was a rubbishy plastic mobile phone charm, but still, we wanted another… The cartoon was activated on multiples of 5, but despite feeding in 10 and then 15 plates we didn’t see the winning version again. We figured that the bill probably wouldn’t be brought to the table and that, with our little table number board that we received at the start, the cashier would just be able to pull up what we owed from how many plates we’d posted. But we missed out a step, at the till we handed over our table number which generated a little flurry of activity as the cashier called across to one of the cleaning ladies who bustled off in the direction of our table. I think we were supposed to press a button to let them know that we’d finished so that someone could check that the table was clear and all plates counted. We apologised for holding up the payment and in typical Japanese fashion, he brushed aside our apology and apologised to us that everything was only in Japanese – not many places in the UK would apologise for having inadequate translation into foreign languages. It was fun to see how mechanised the restaurant experience could be and at an incredibly low price too – we greedily ate until we were almost ready to burst but still spent less than £5 each (not including drinks). 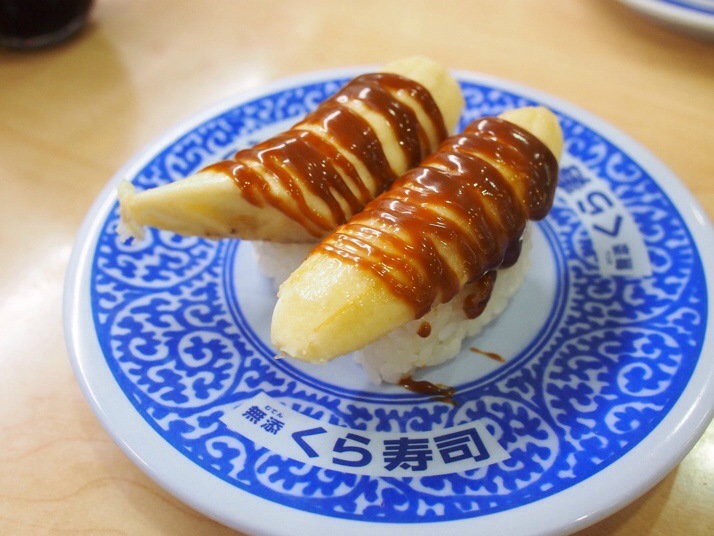 We enjoyed the experience so much that we sought out another branch of the restaurant in Tokyo, it was just as yummy but not quite the same without the adrenaline rush of trying to figure out how everything worked! 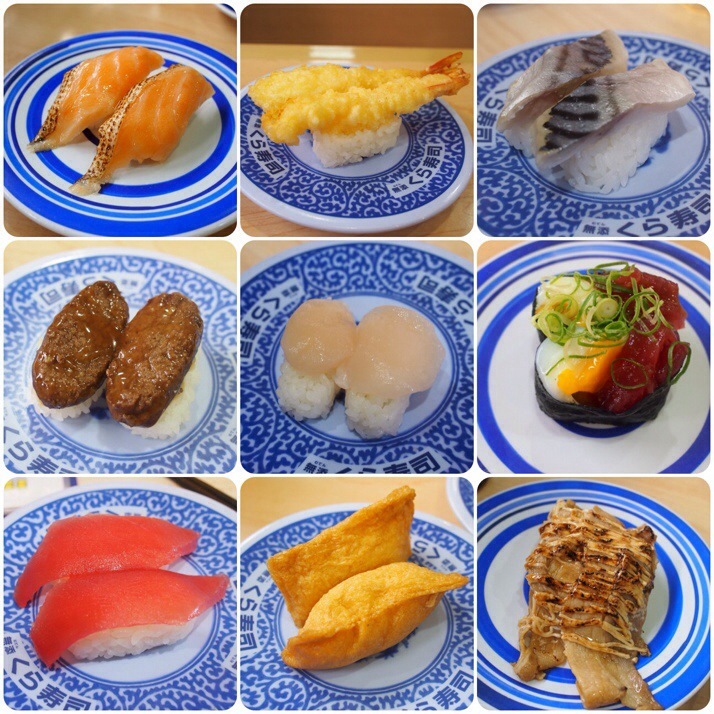 This entry was posted in Experiences and tagged Food, Japan on July 8, 2014 by Julie. It was great although we felt very silly for the first 5 or so minutes when we had no food and no drink and couldn’t work out how to get either! Hey nice adventure! i miss Japan! I was looking for the name of the revolving sushi restaurant that we’ve visited and thank goodness I found your site… (It’s KURA sushi) Thanks again. I hope you could also drop by my blog. – thanks and hope to hear from you! More power to your blog! I have emailled a photo to you – best to check your spam filter if it hasn’t arrived in your inbox as images sometimes get caught. What is 27 + 16 ?